In February, I presented some of our ESID research findings on the politics of natural resources extraction to a UN Economic Commission for Africa meeting on ‘Institutions, decentralization and structural transformation in Eastern Africa’, held in Nairobi, Kenya. The occasion was the 20th Intergovernmental Committee of Experts (ICE) Meeting of the United Nations Economic Commission for Africa/Sub-regional Office for Eastern Africa (UNECA/SRO-EA) (8-11 February 2016). I was there at the invitation of the University of Queensland’s Centre for Social Responsibility in Mining (CRSM). 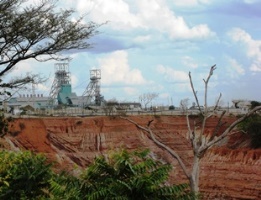 Two CRSM researchers, Dr Kathryn Sturman and Fitsum Weldegiorgis, have worked on a DFID-funded literature review project entitled: “The impact of extractive industries on political settlements and conflict in East Africa”. Their aim is to apply the political settlements framework to mining, oil and gas developments in Kenya, Ethiopia and Rwanda. Having heard about the similar research project by ESID in Zambia, Ghana and Latin America, they felt our insights might validate the political settlements approach to this topic (extractive industries), and highlight the value and limitations of comparative analysis. Together with Berouk Mesfin of the Institute for Security Studies (Ethiopia), Joshua Laichena and Hannah Wangome of KIPPRA (Kenya) and Dr Kathryn Sturman and Fitsum Weldegiorgis (CSRM), we presented the challenges and risks of the exploration and exploitation of newly discovered natural resources in Kenya, Ethiopia and Rwanda within a comparative setting. Zambia acted as a counterexample, in the sense that natural resources have dominated its political and economic landscape for over a century. The audience, mostly officials from Kenya’s ministries and counties, appreciated the political settlement analysis and showed a great apprehension of the political and security risks of natural resources within devolved systems (i.e., Peru). They highlighted the challenges of small-scale mining; environmental degradation of mining activities; inadequate regulatory frameworks and benefit-sharing mechanisms; and the difficulty of not having mining as a devolved function. The responses to these challenges were, among others: formalisation of small-scale mining; and holding multinational companies accountable for environmental degradation through exit clauses in the contractual agreements between the companies and the national government. Noteworthy is the delegates’ emphasis on sensitisation as a prerequisite to alleviate conflict before resources begin to flow, in order to manage expectations. The political economy within which development in a country is being implemented has to be factored into the planning. Resource discoveries and expected resources revenues may shape, and be shaped by, political settlements. This dictates “how power is organised and exercised” in enabling development and conflict transformation in both national and county governments. 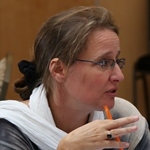 Marja Hinfelaar is Director Research and Programs, Southern African Institute for Policy and Research (SAIPAR), Zambia. She is lead researcher for ESID’s politics of natural resources project in Zambia.